Mahima for Life™ Greens Best Blood Sugar Support Formula is a delicious blend of vegetables, berries, and specially selected herbs, uniquely targeted to support blood sugar balance while at the same time, addressing the problems caused by its fluctuations and imbalances. As an added benefit, this formula is full of Antioxidants and nutrients which supports health and well being. Mahima for Life Greens Best Blood Sugar Support Formula is a delicious blend of vegetables, berries, and specially selected herbs, uniquely targeted to support blood sugar balance while at the same time, addressing the problems caused by its fluctuations and imbalances. As an added benefit, this formula is full of Antioxidants and nutrients which supports health and well being. Serving size: 10.2g (1 Scoop) Servings per container 30. 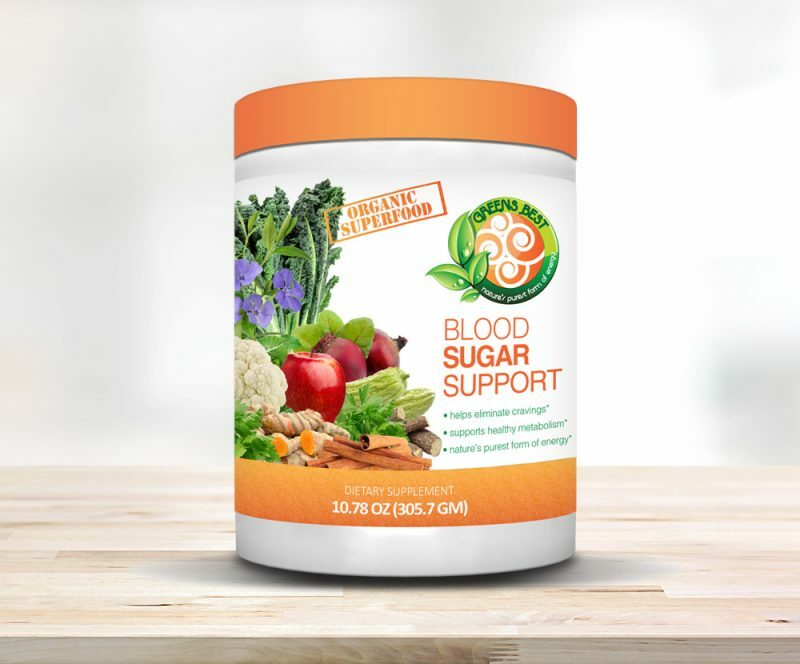 Blood Sugar Support Blend 1720 mg Chromemate, fenugreek, Cinnamon, Amla, Gymnema Sylvester, Neem, American Ginseng, Salacia Reticulata, Bitter Melon, Jambolan, Banaba, Pterocarpus Marsupium, Pata de Vaca, Tribulus Terrestris, Periwinkle. 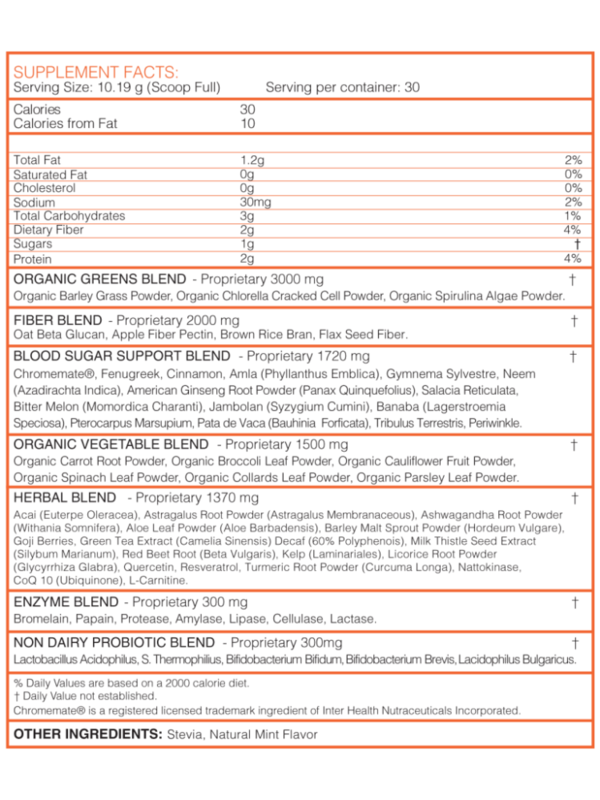 Organic Vegetable Proprietary Blend 1500 mg Carrot (organic), Broccoli (organic), Cauliflower (Organic), Spinach (Organic), Kale (Organic) Parsley (Organic). Fiber Blend Proprietary 2000 mg Oat Beta Glucan, Apple Fiber Pectin, Brown Rice Bran, Flax Seed Fiber. Enzyme Blend Proprietary 300 mg Bromelain, Papain, Protease, Amylase, Lipase, Cellulase, Lactase. Probiotics (dairy free) 300 mg Lacidophilus ,S. Thermophilus, Bifidobacterium Bifidum, Bifidobacterium Brevis, Lactobacillus Bulgaricus. Gogi Berries, Green Tea Extracts Decaf (60% Polyphenols) Milk Thistle Seed Extract, Red Beet Root, Kelp, Licorice, Quercetin, Resveratrol, Tumeric, Nattokinase, CoQ10, L Carnitine, Lecithin. Other Ingredients: Stevia, Mint Flavor. SUGGESTED USE: Take one full scoop with 8 to 12 ounces of water. Stir briskly and enjoy one or more times a day. Greens Best Blood Sugar Support is best taken on an empty stomach first thing in the morning.